Want peace in your home? Try this one it might convey your message to your family that you want PEACE! 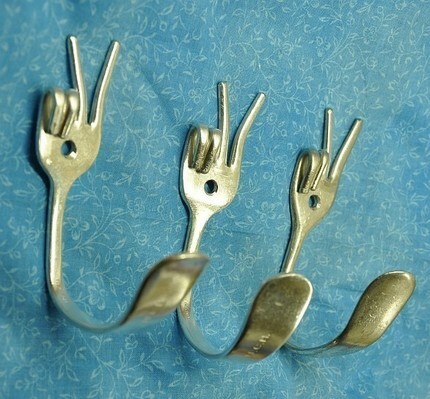 Anyway this Peace Special set of 3 Silverware Coat Hooks caught my attention because of its unique and cute design. They're very attractive and will always remind every family member to have peace. This set got stylish coat hooks and it can be used also for towels, hats, backpacks and others. The fork is bent into a hook, drilled in the middle and the tines are bent into fun designs. A finished hook measures approx. 3" deep, 4" tall and 2" wide. Made to order and silverware patterns vary.